I love when royals are inventive with their jewels, and Queen Sirikit's use of her gorgeous diamond fringe tiara definitely fits that bill. The tiara is designed in a traditional Russian style; most royal families have at least one of these tiaras, which are meant to resemble the kokoshnik headdresses worn by women in Russia. Over the years, the queen has worn the fringe both in that kokoshnik-esque halo form, stretching around her head, and bunched tightly atop her head like a crown, a traditional Thai way of wearing a diadem. Although, like many other Asian royal families, the Thai royals only began wearing Western-style tiaras relatively recently, the family today has an extensive and impressive collection of jewels. This particular tiara is reportedly one of the most important pieces in the vaults, having apparently been owned by Queen Saovabha Bongsri, who became the first female regent of the country in 1897. 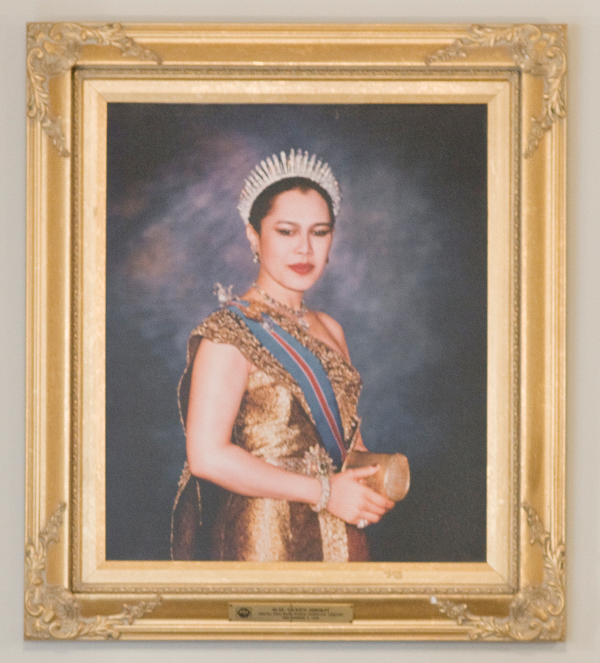 Indeed, many of the portraits of Queen Sirikit depict her wearing this tiara, underscoring its significance. 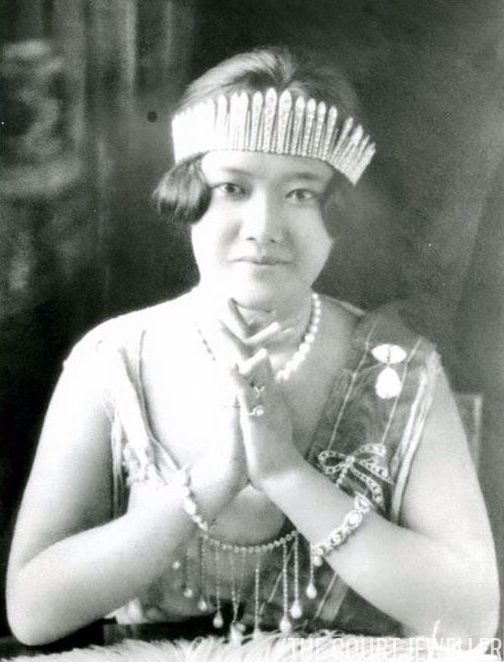 Sirikit isn't the only Thai royal lady who has worn the tiara. Queen Saovabha Bongsri's daughter-in-law, Queen Rambhai Barni, wore the tiara in the 1920s. Above, you can see her wearing it à la Josephine -- across the forehead in the trendy bandeau style of the time. Princess Bejaratana, the only daughter of King Vajiravudh, also wore the tiara. Like many diamond fringes, the tiara can also be worn as a necklace. 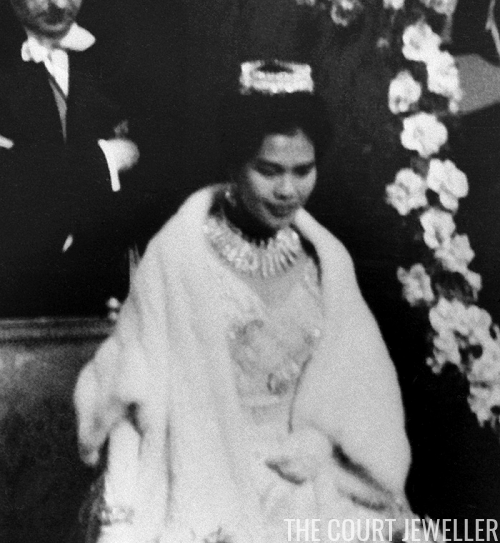 Above, Sirikit wears it in necklace form with a traditional Thai tiara at the opera in Paris in 1960. 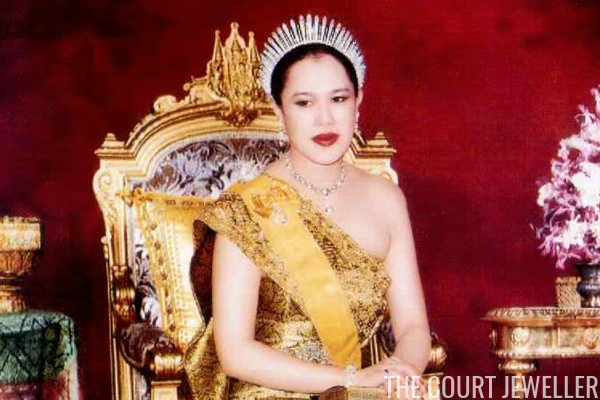 Sirikit wore the diamond fringe at gala events throughout her late husband's reign. Unfortunately, Sirikit's health has declined in recent years; she suffered a stroke in 2012, and she rarely makes public appearances. But images of her wearing the tiara are prevalent in the country, and it has become a familiar symbol of her royal position.